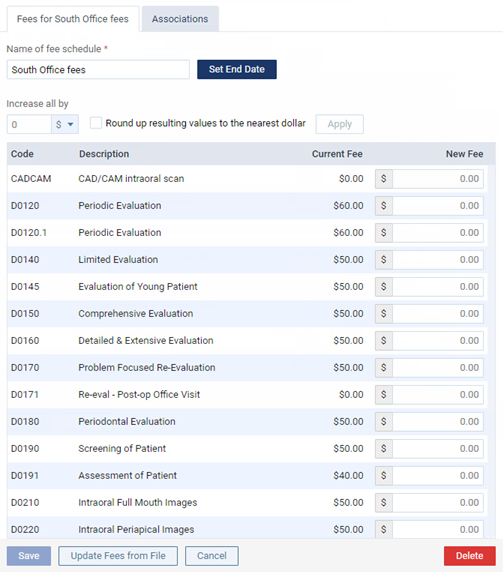 You can delete a fee schedule only if it is not selected as the preferred fee schedule for any providers, insurance plans, patients, or locations. This does not affect procedures that have already been billed and/or submitted to insurance. 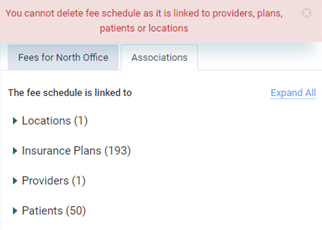 If the fee schedule is linked to a provider, insurance plan, patient, or location, an error message appears, and the Associations tab for the fee schedule becomes selected automatically. Click (or tap) a category (Locations, Insurance Plans, Providers, or Patients) or the Expand All link to view the associations. You must remove all associations before you can delete the fee schedule. You cannot remove associations from this page. You must do so by going to the source of the association (for example, a provider's user account) and removing or changing the selected fee schedule for that source. So how do I delete/unlink a fee schedule from a provider? With a fee schedule selected, click the Associations tab. 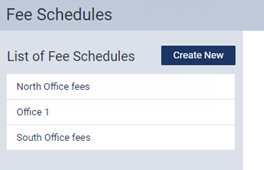 For each provider listed, go to that user's settings (Settings > User Accounts > select the user), click the Fees tab, and then select a different fee schedule.